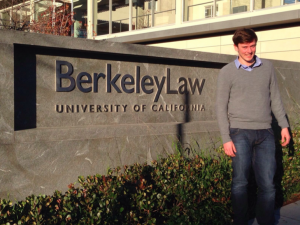 Joseph Damamme is currently a Visiting Scholar at the Law School of the University of California, Berkeley (1 January – 6 April 2017). The research stay will allow him to explore key aspects of US Labor Law and US Disability Discrimination Law (and their interplay) under the supervision of Prof. Oppenheimer. This stay is part of his PhD research on the contribution and the limits of Non-Discrimination Law for the inclusion of persons with Disabilities on the labor market. In addition, Joseph will also learn on the methods and good practice employed for the inclusion of students with disabilities and follow the work of the Berkeley Workers’ Rights Clinic. Joseph Damamme is a PhD candidate at the Centre of European Law, Scientific Collaborator at the Centre Perelman of the ULB and member of the Equality Law Clinic. His PhD supervisors are Prof. E. Bribosia (Centre of European Law) and Prof. I. Rorive (Perelman Centre).